For the third weekend in a row, I found myself at the Continental Divide! The first was two weeks ago on a very unexpected drive through Rocky Mountain National Park on Trail Ridge Road. No pictures of that, unfortunately, because I was driving and we were engulfed in a cloud! 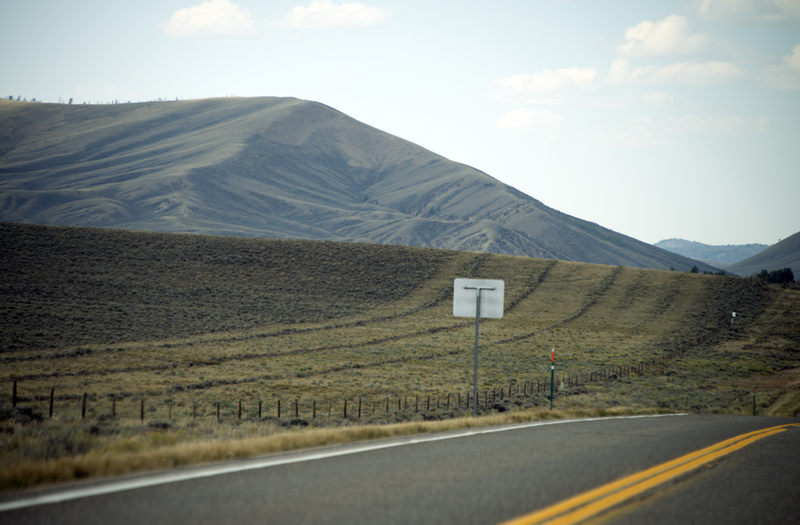 The time second was a week ago on a trip through Independence Pass – a spontaneous road trip. This time was well-planned, however. My husband had mapped out a daytrip loop that we executed beautifully. We set out in the most wonderful weather on Labor Day Sunday. We didn’t rush and made it out of the driveway about 10:30am. 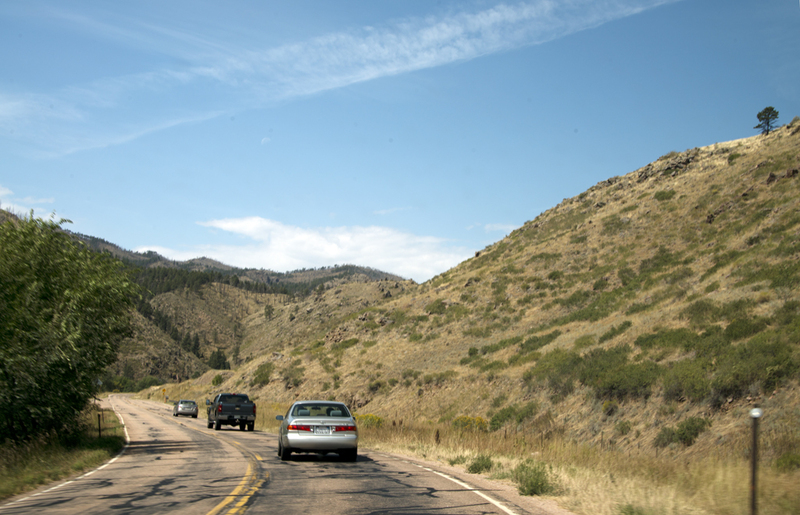 We drove north on Colorado Highway 287 which runs pretty much due north from our Broomfield home to Ft. Collins. 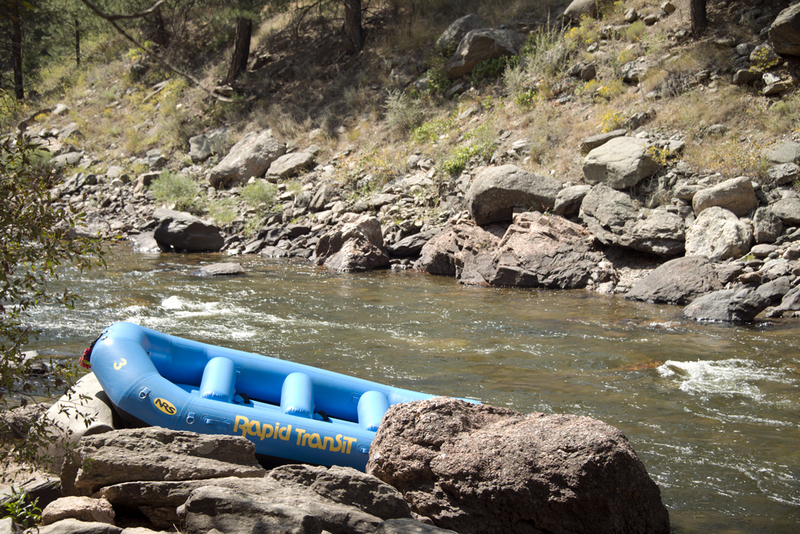 Just past the Fort, we turned west toward the mountains on Colorado Highway 14, which took us all the way through Cameron Pass to Walden, CO.
Highway 14 runs through Poudre Canyon, named after the river that carved it out, Cache La Poudre River. Pronounced “cash la pooder”, it’s kind of hard to get used to saying it. 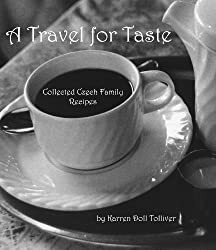 It translates from the French as Cache of Powder, where, according to legend, a French fur trader had to off-load some gunpowder from an overloaded wagon during a snowstorm. Could also mean a cache of snow, for that matter. Our first stop was at Picnic Rock, where lots of people with lots of kids were playing in the cold, cold water among the smooth river stones. Along the river for most of the trip up to the pass we saw numerous fly fishers, too. We discovered a bike rally in progress in a town called Rustic. In fact, we saw tons of motorcycles during our drive. There is an event called Thunder in the Rockies hosted by Thunder Mountain Harley in Loveland, CO, every Labor Day weekend. Maybe that’s where they were all from. These may have been from a wildfire started by lightning in 2012. Apparently it was a biggie – over 87,000 acres burned, one person died in the fire, and many evacuated. Glad to see it’s growing back. Eventually we reached Cameron Pass (10,276 feet above sea level = the Continental Divide at this point), where there was a pull-off and picnic tables. We had our lunch there and people-watched for a while, though it was quite chilly. We even horse-watched! 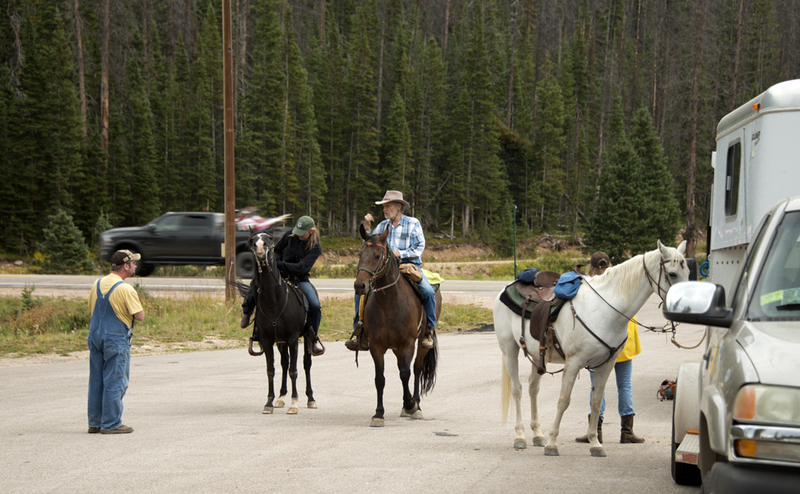 These people emerged from the forest on the other side of the highway and put their animals away in a horse trailer parked in the picnic area. They looked very happy and even pooper-scooped their horses with a great big shovel. 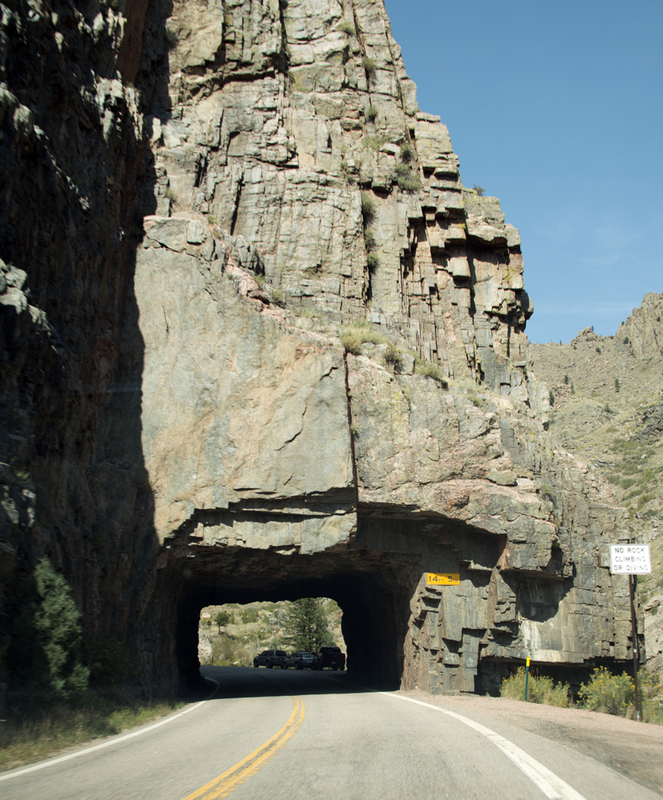 Cameron Pass was named for Robert Cameron, who founded the Ft. Collins Agricultural Colony in the 1870s. On the north side of the pass are the appropriately-named Never Summer Mountains. To the north are the Medicine Bow Mountains. The pass isn’t high enough that they close the road in winter. Instead, lots of sportspeople head out and do snowmobiling and backcountry skiing along it. We saw tons of campsite, too. After ducking some birds during our picnic, which I’ve discovered are grey jays, and packing up, we continued our road trip down the western slope. The grade was steeper and the slopes more forested. I’m realizing the lack of what I’d consider adequate guard rails is a normal thing around here. Still getting used to that! A real, live moose! And he wasn’t in a zoo! 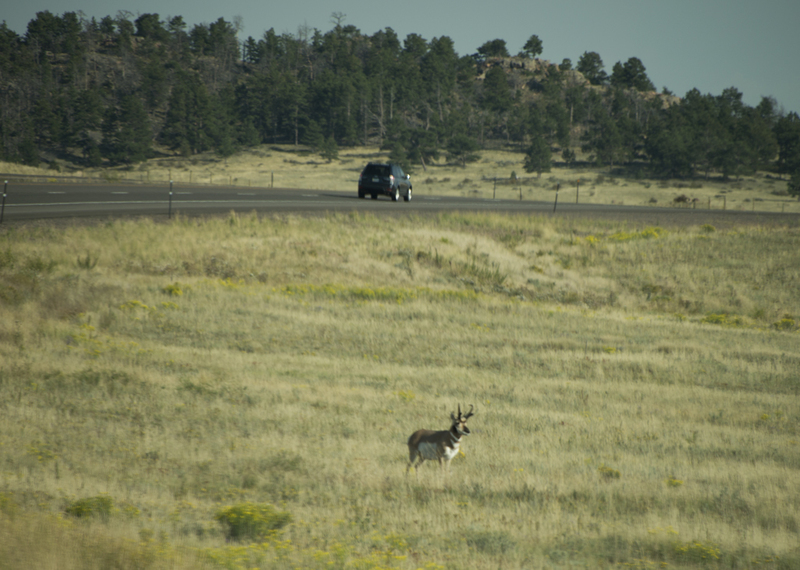 We’ve learned that, when there are several cars parked alongside the road not near a pull-off, and especially when people are standing on the shoulder with cameras, it’s usually wildlife. I’ve seen deer and lots of elk this way. 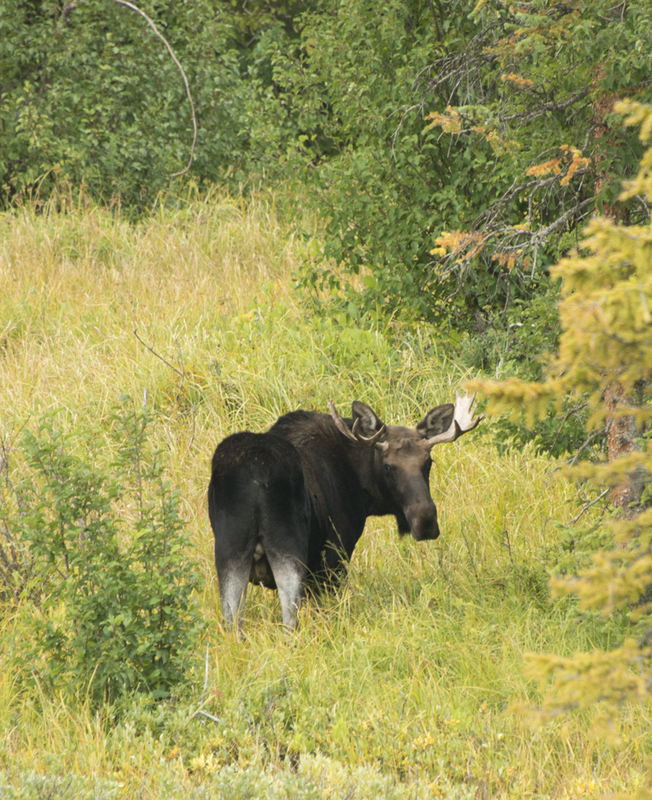 This time, though, it was a bull moose. He was not cooperating with us at first – he grazed with his back to us for quite a while. Eventually he turned to look at us and I got this shot. I guess he was saying, “If you really want my picture, here’s my balls along with my face!” It’s not the best photo of a moose, and it won’t be the last, but it’s my trophy of the day. I considered going down the embankment of the road to get closer, but, it’s like with sharks: he’s in his environment, you’re not. And there were enough people with phone cameras at the ready that I didn’t want to be the next viral internet video! I don’t have so many photos of the trip after that. I was getting tired. But it was a wonderful leg of the journey. 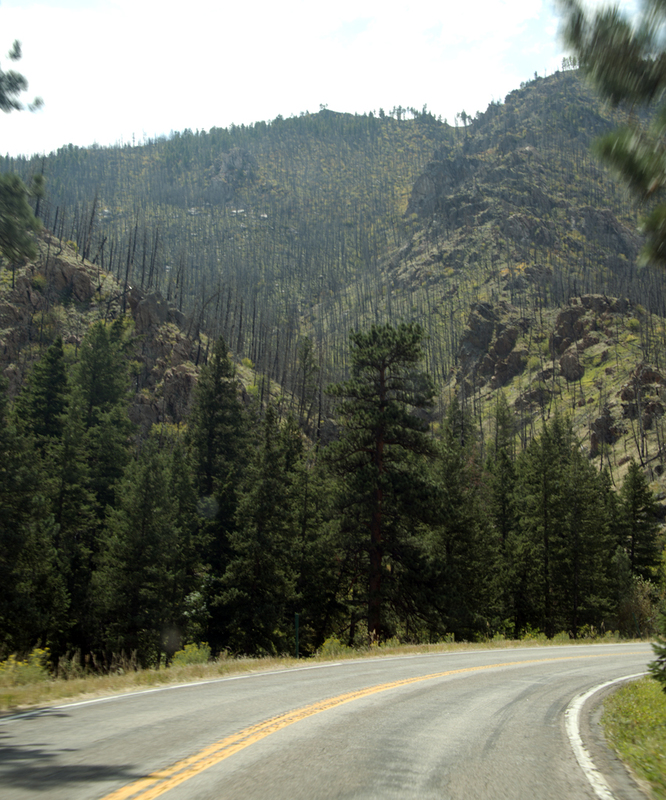 We arrived in Walden, CO, and turned north on CO 125. That turned into WY 127 once we crossed the state line. See that cowboy emblem on a bucking bronc? 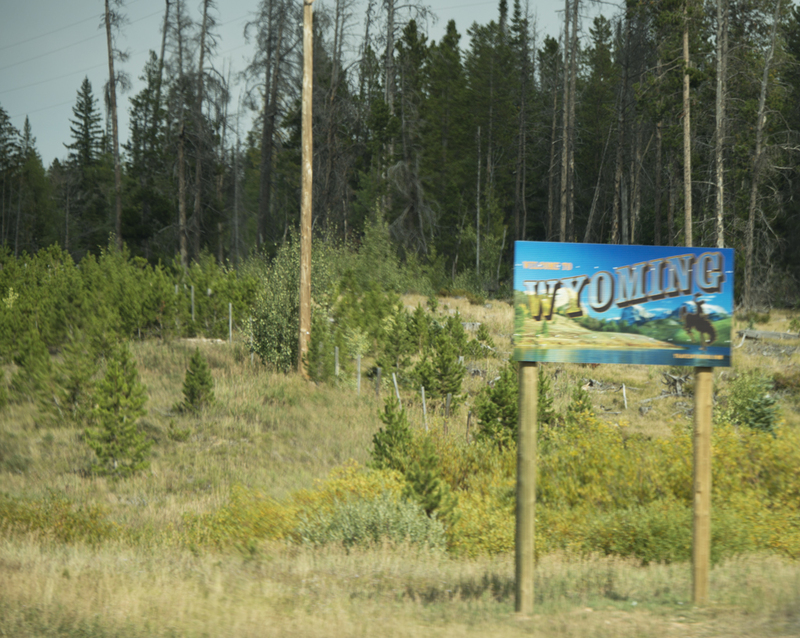 That’s Wyoming’s symbol – it’s even on their license plates. It was my second time in Wyoming – see my post about the eclipse last year – and I’m so amazed by the many changes in terrain within relatively short distances. 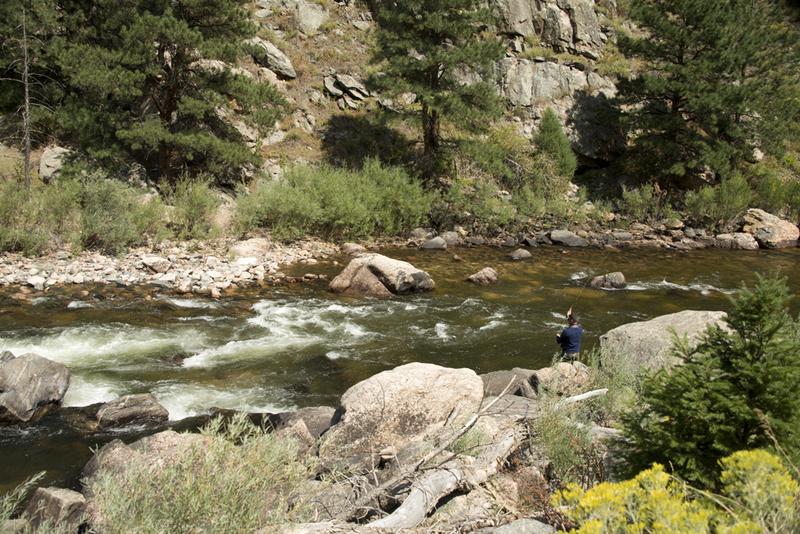 A large part of that leg of the trip was in Medicine Bow National Forest. When we passed a few cattle grazing freely beside the road, we thought they’d escaped from an enclosure. Nope! Turns out that Wyoming has open-grazing laws, which means that cattle owners don’t have to fence their cattle in. Instead, land owners who don’t want cattle on their land have to fence them out! And it means that cattle are free to graze on public lands, including the national forests, too. It also means, if you’re driving through this land, watch out for beefs walking around! 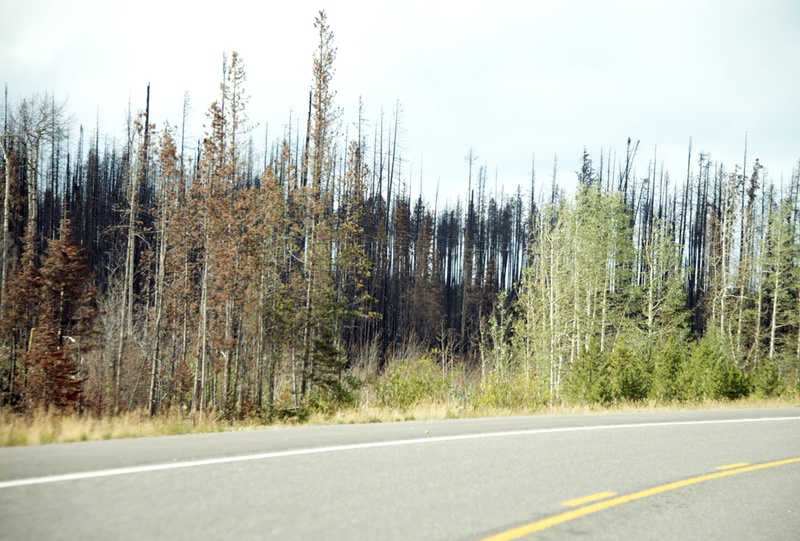 In Medicine Bow I saw lots of burned trees, too, and fairly recently. However, since the trees along the roadway hadn’t been burned, it looked like a prescribed burn. I found an announcement online that they were planning such in April this year. 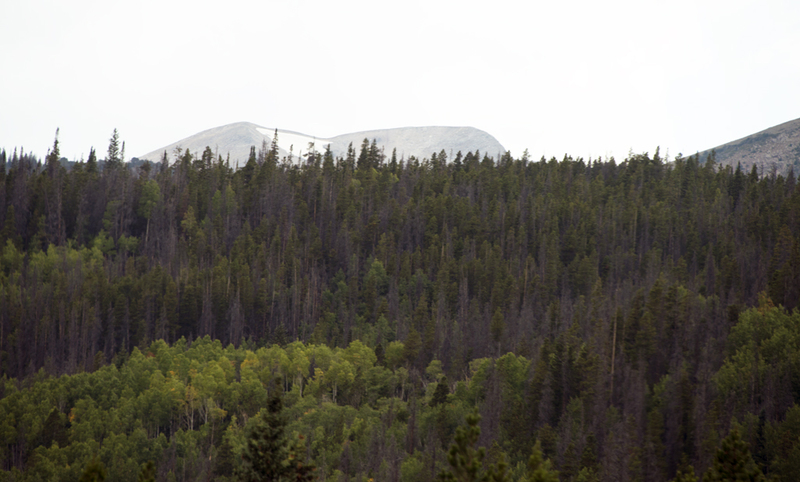 We also got to see some trees changing color, especially the aspens in the higher elevations. It seems that, with Labor Day, the Rockies have flipped a switch to autumn. We’re looking forward to seeing great colors this year! 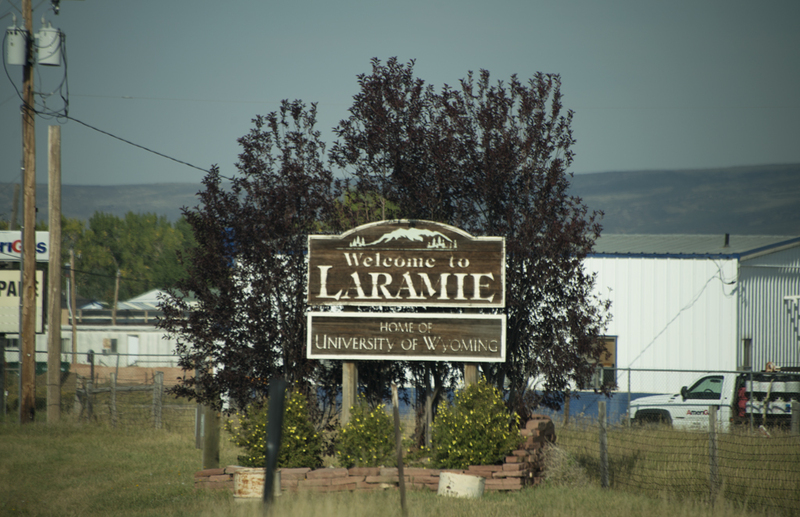 We eventually made it to Laramie – which is also the name of the cigarettes brand in the Simpsons. Here’s pretty much my impression of the whole place: Well, that and lots of railroad tracks and snow fences. They must get hit hard up there in winter. Not a great picture, but it answers my question. And we saw lots of them! Our entire road trip took about eight hours or so, with frequent stops and lots of great scenery and wildlife to photograph. I’d highly recommend the route. Maybe next weekend another spot in the Continental Divide? Who knows? So enjoy taking these journey’s with you. 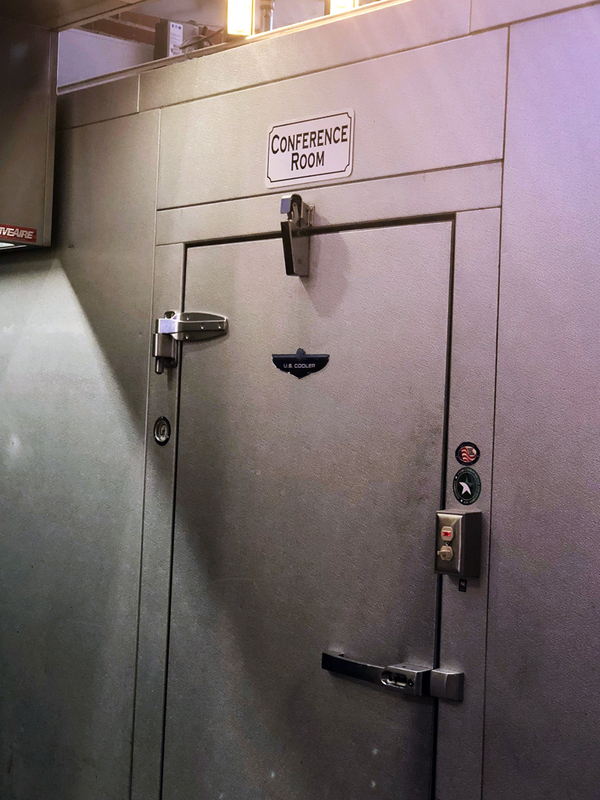 Love that conference room! 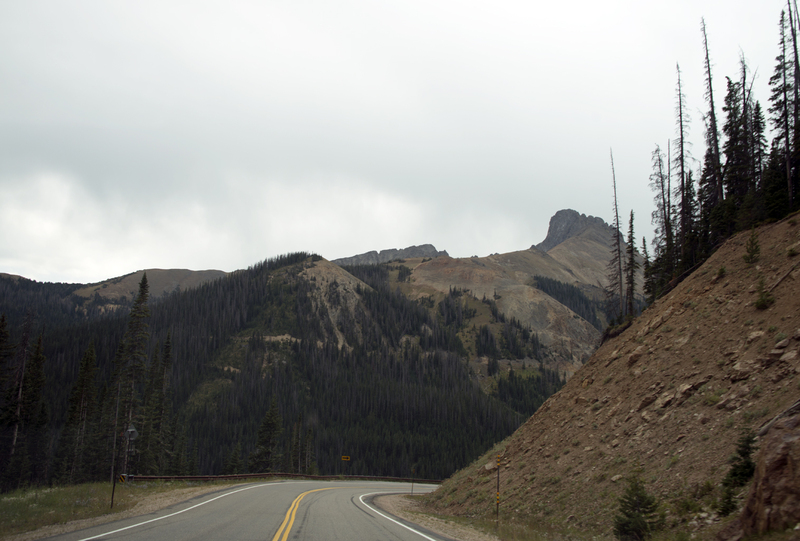 I feel as if I may have left this comment before so I apologize if I’m repeating myself, but your drive reminded me of the time we drove through Rocky Mountain National Park and righto – no guard rails, sky high drops, AND signs that said Caution: Freshly Oiled Road Surface. Say what??? Thank you again for another small respite from my day!